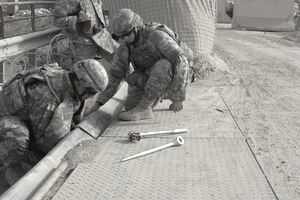 Bridge builders are highly-skilled engineers and are among the Army's most valued experts. There is any number of scenarios where a Bridge Crewmember would need to step in to save the day, whether it's building safe passage for a crossing during a combat operation, or making rough terrain more easily passable for platoons and squads. If the bridge crewmembers aren't around, in many cases, the Army can't move forward (literally). So this role is crucial to keeping the Army going where it needs to. This job is categorized as Army military occupational specialty (MOS) 12C. These soldiers operate bridge trucks and light vehicles and act as deckhands on bridge erection boats. They prep bridge sites, which includes rafts, and other bridge operations, and install kedge anchorage systems, wire obstacle material (think barbed wire), overhead anchorage systems and demolition firing systems. They'll also launch and retrieve ribbon bridge bays, and assemble and maintain military fixed and float bridges. This work is performed in all kinds of scenarios and weather, including while under enemy fire, in rain and snow and extreme heat, and during natural disasters. In short, MOS 12C is not just a role where you're looking at blueprints and engineering plans. You'll get your hands dirty and possibly see combat action, in this job. Job training for bridge crewmembers will include 14 weeks of One Station Unit Training, which includes Basic Combat Training and Advanced Individual Training. There may be scenarios where you'll be working alongside other engineering soldiers, such as MOS 12B, combat engineers. Their job involves placing and detecting explosives and preparing firing positions for combat situations, so a close working relationship between 12B and the bridge crewmembers is obviously important. You'll need a score of at least 87 on the combat (CO) area of the Armed Services Vocational Aptitude Battery (ASVAB) tests. There's no Department of Defense security clearance needed for this job, but you do need a valid state driver's license. If you are colorblind, you won't be eligible for MOS 12C; normal color vision is required. The skills you learn as an Army bridge crewmember will help prepare you for practically any position in the field of construction. While not all of your training will translate directly, since much of what you learn is how to build structures quickly in combat situations, you'll probably be overqualified to work on most construction sites. You may even consider pursuing a career as an engineer or architect if you want to continue building things from scratch. These two professions will mean additional training and licensure, so get to know the requirements in your area.